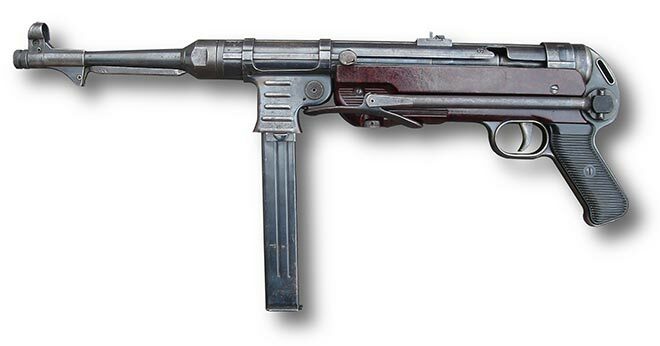 Probably the best infantry rifle in any army in WW2, it was accurate, powerful and reliable. 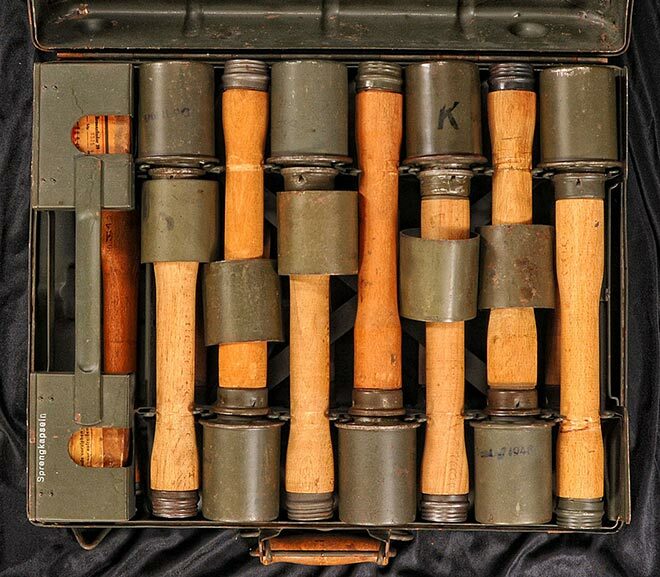 It’s disadvantage was its weight, just over ten pounds, and the fact that the 8 round clip would make a distinctive noise alerting the enemy when the weapon was empty. American soldiers recognized this and sometimes simulated the sound of an ejecting clip to persuade the Germans to attack. A smaller, lighter version of the M1 Garand, it weighed just 5.5 pounds, had a more rapid rate of fire than its big sister the rifle, but was less powerful and less accurate. It was originally intended for non-frontline troops, but became popular with officers and NCOs. It was too heavy at 21 pounds (unloaded) with too-small a magazine (20 rounds) but it was the standard-issue light machine gun. Very much inferior to the German light machine gun. An early use of rockets, the bazooka fired a 2.3 inch (diameter) round. At 54.7 inches in length and weighing almost 13 pounds (plus shells that weighed from 3.4 to 6.1 pounds each) it was an awkward weapon requiring two soldiers to fire it. It had numerous disadvantages: smoke trail and firing position revealed its firing team to the enemy, and it was too weak to penetrate most German tanks. Originally designed to be used by tank crews, the Schmeisser (a name it acquired, despite being designed by some dude named Vollmer and not by Schmeisser) fired 400 rounds a minute and was moderately accurate up to about 200 yards. The MG-42 with its firing rate of 1500-1800 rounds per minute was a formidable weapon that gave the Germans an advantage since American troop carried only the BAR light machine gun which had a third the rate of fire. The standard infantry weapon for German troops, it was a bolt action single shot rifle, meaning that the soldier had tow work the bolt to chamber each new round, unlike the American M1 Garand which allowed soldiers to fire an 8 round clip. It weighed just under a pound and a half and carried just 2 ounces of TNT explosive. A soldier would pull the pin, release the lever which would spring away, and throw. The fuse was set for five seconds. The “pineapple” shape was designed to cause the individual squares to explode outward killing or maiming within about a 5 meter range. Nicknamed the “potato masher” the German hand grenade was mounted on a wooden throwing handle. 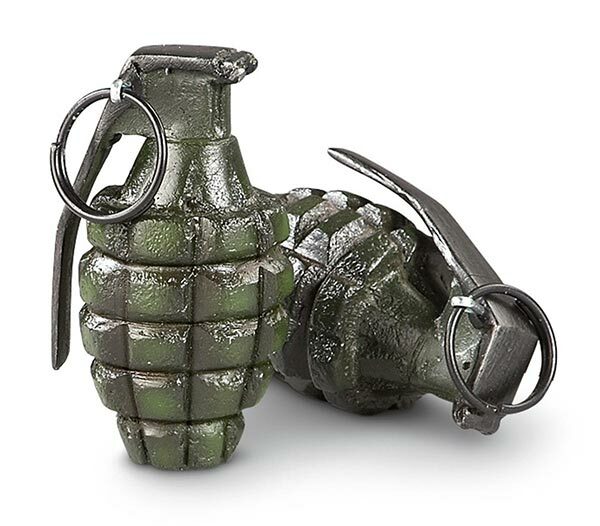 It was fused for five seconds, like the American grenade, but the thin metal shell meant less damage from shrapnel. A double-edged dagger traditionally worn by men in some parts of the Arab world. A two-man dive-bomber that was often equipped with an air siren to make a terrifying sound as it dived. Deadly effective early on during the Blitzkrieg into Poland and France, it was too slow to face Allies fighters later in the war. 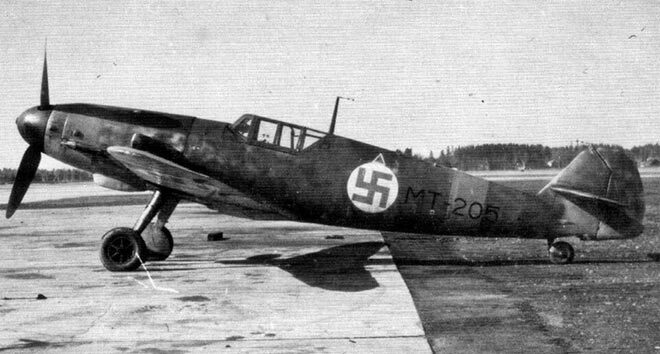 Usually called the Me 109, it was quick and adaptable and was better than all early Allied fighters except the British Spitfire, which was its equal but not its superior. 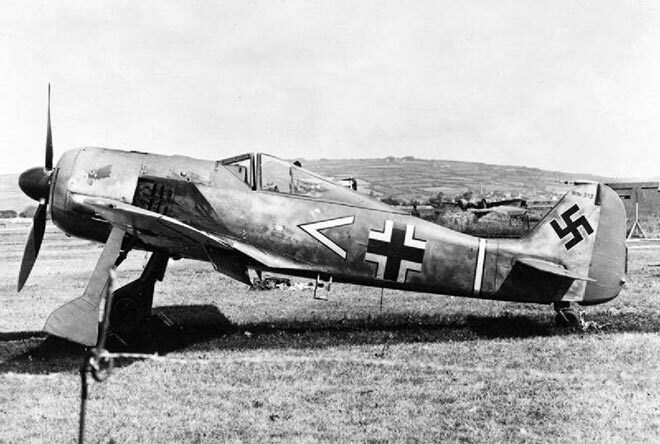 It carried a 20 mm cannon that fired through its propeller hub, plus two wing-mounted machine guns. At low altitudes it beat everything in the sky until later models of the Spitfire came along. It was less effective at high altitudes which limited its impact on Allied bombers. But in aerial combat it was superb. The hero of the Battle of Britain, the Spitfire was fast, maneuverable and loved by pilots. In its most typical configuration it carried two cannon and four machine guns and had a range almost twice that of German fighters. 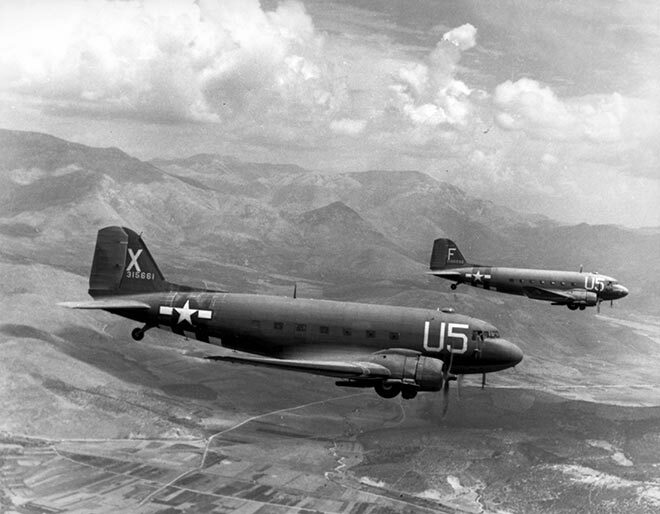 The work-horse of the American Army Air Corps, the C-47 could be used to haul supplies, ferry generals or drop paratroopers. Unsexy but very useful. One of two main bombers used by the Americans, the Fortress was famous for its ability to stay in the air despite tremendous damage. It carried a crew of 10, mounted 12 machine guns in the waist, the nose, the tail and the belly and could deliver 6 tons of bombs at a range of just over a thousand miles fully loaded. 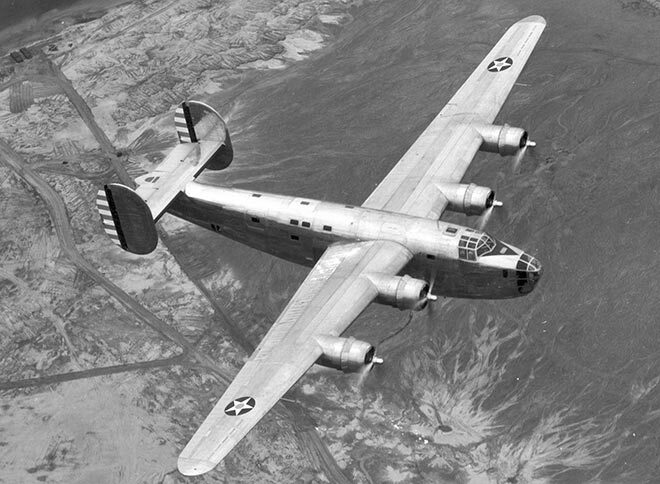 The Liberator never achieved the mythic status of the B-17 though more B-24s were made. 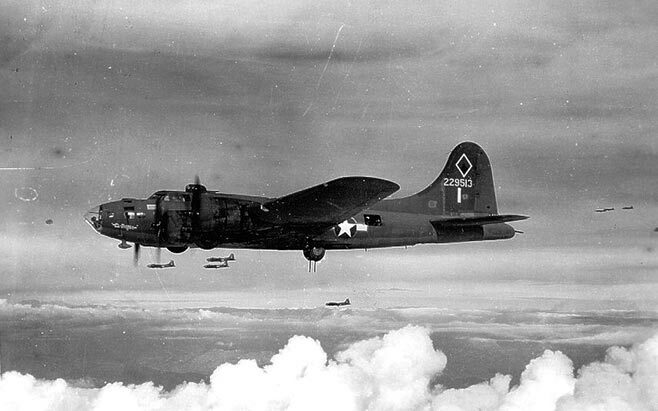 It flew farther and carried more bombs than the B-17, but was also harder to fly which put more stress on air crew. Overall it was the equal of the B-17, but since it was unattractive, it got less press. It was cheap, reliable and could be produced in great numbers. 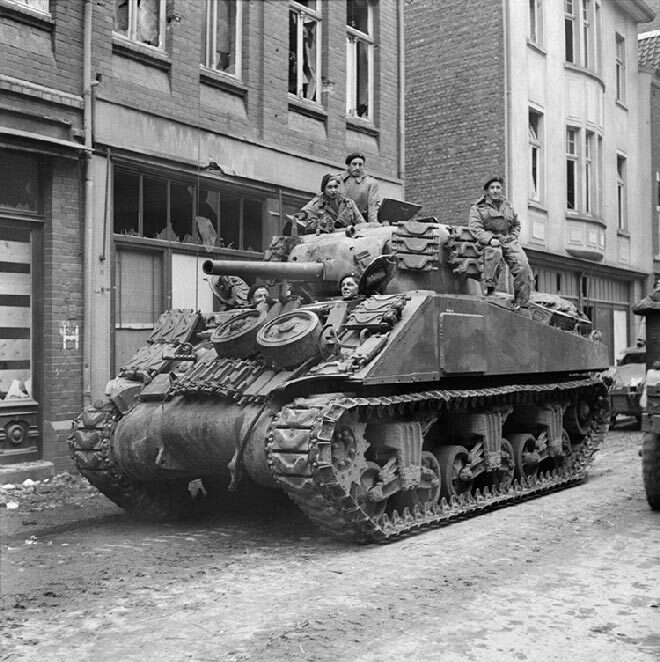 But the Sherman was a medium tank with a short-barreled 76 mm main gun that had very little effect on German Panzers, especially the heavy Tiger. It had a crew of 5 and the unfortunate nickname, “Ronson” after the cigarette lighters. Panzer is a catch-all term for various German tanks, culminating in the terrifying King Tiger, which at 68 tons weighed twice what the American Sherman weighed, had much thicker armor and fired more powerful shells. 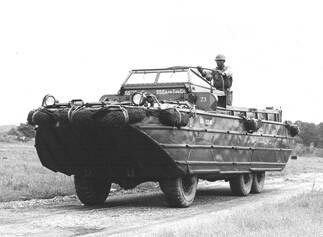 The Duck was basically a truck retrofitted to be amphibious. It could roll off an LST well off the beach, motor through the water and directly up onto land to disgorge troops. 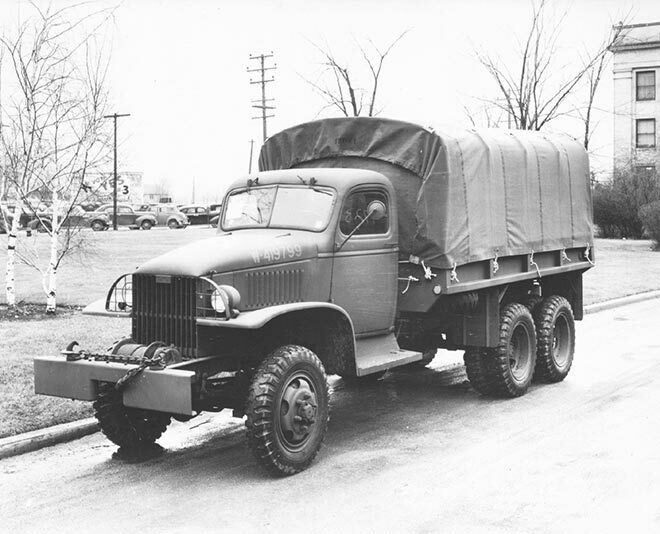 The workhorse truck of the American army, it produced just 91 horsepower (less than than Mini Cooper) and had a maximum speed of 45 miles an hour, but it was rugged, durable and could be adapted a wide range of activities from troop transport to water tanker to mobile operating theater. The Germans were so impressed by this vehicle that they copied it. 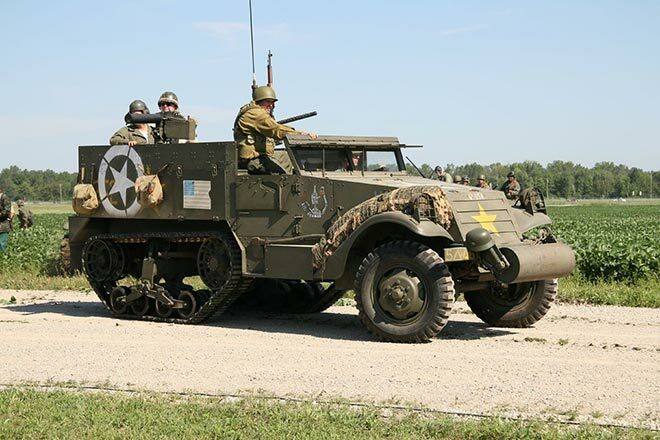 The half-track had conventional steering wheels at the front, and tank-style treads at the rear to enable it to cross difficult terrain. It could carry ten soldiers into battle.